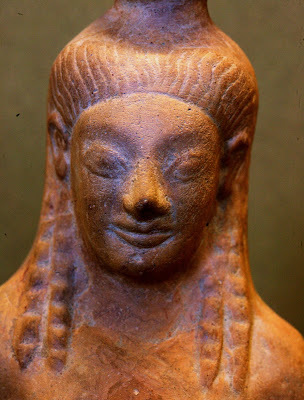 All photos of the ancient art in this posting are related to the archaic Indo-Greek people. 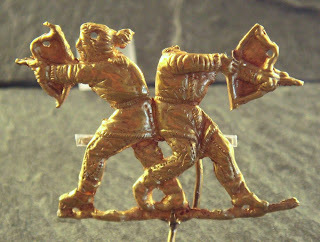 See next blog-post to learn more about the Indo-Scythians. 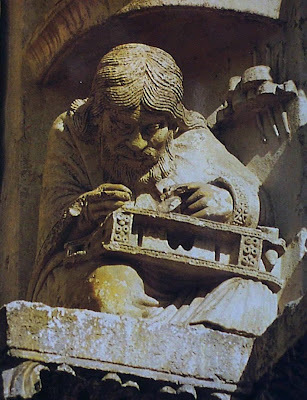 Sculpture of Pythagoras within the tympanum at the right bay of the royal portal of Chartres Cathedral , situated on top of the middle column of the right jamb. mostly constructed between 1193 and 1250. Archaic detail: The Capitoline Triad Rome, Italy by Ortygia, Roger Ulrich, 2009. 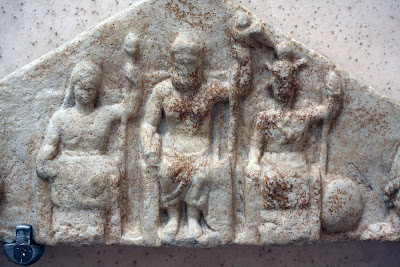 A Scythian woman Artemis Bendis from Asia Minor and archaic Greek men. 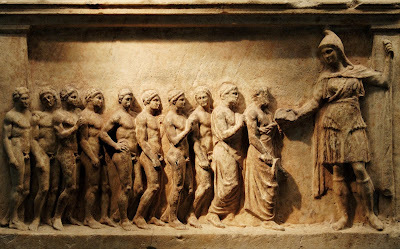 Marble votive relief, made in Athens, ca. 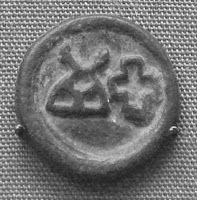 400-375 BC. Photo by Marie-Lan Nguyen, 2007. 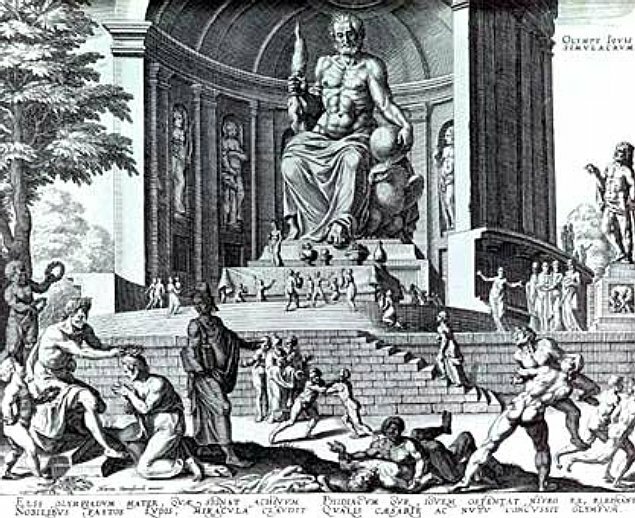 Pay attention to the body stature of the Greek men versus the woman from Asia Minor, even if the depiction is a gross exaggeration of the difference in body stature there is a core of truth in this generalization. Normally there is variation in body stature in all populations. The Capitoline Triad Rome, Italy by Ortygia, Roger Ulrich, 2009. 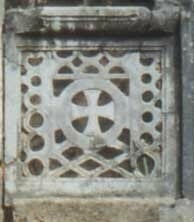 Try to Google: "Capitoline Triad Rome" and you will see very different and newer depictions of this triad, with people of another ethnic origin than in this archaic panel. There have been massive reproduction of "ancient" art since the medieval in Europe, some of it in an effort to change (rewrite) history. Trojansk søyle. Grekerne og Skyterne i kamp. 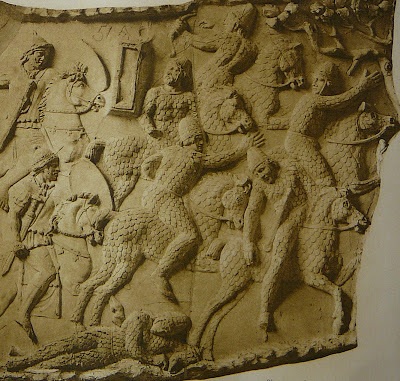 Reliefs from the Trojan column, the Greek fighting the Scythians. 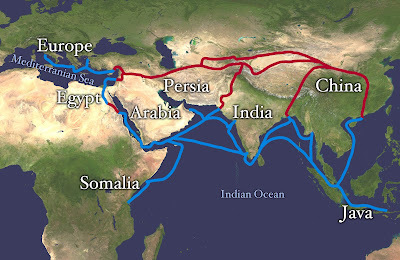 The extent of Two Silk Routes - Silk Roads. RED is a land route (there were in fact several) over the Central Asian steppes and the BLUE are more ancient sea-water routes used since ancient times. 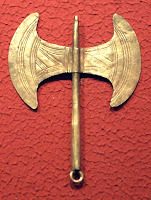 Fenicians i.e. 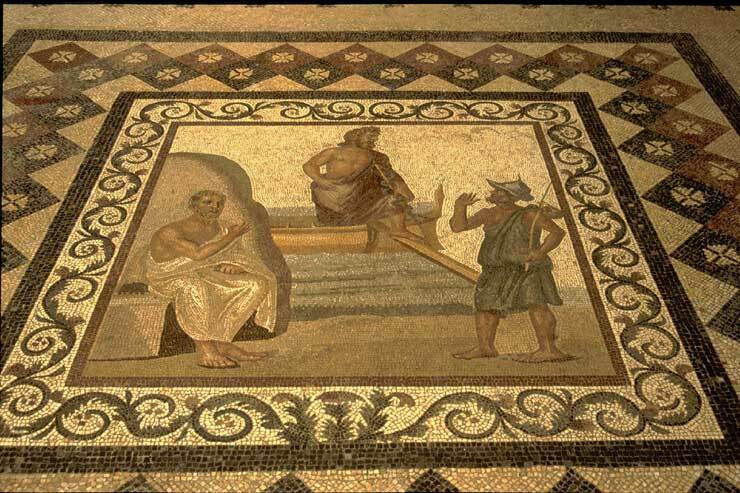 Phoenicians were likely central in trade via the sea. Some of the Central Asian silk-roads went further north than shown in this map e.g. to Kaffa, Sarai, Saraichik, Altai, Balkhash, and Alma-Ata. See map: The Great Silk Road Map. Archaic Roman Empire governed from Rome: Painting from Pompej Pompeii in Italy. 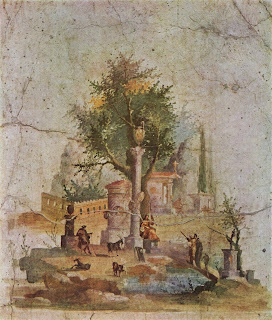 Maler c. 60 BCE Villa dei Misteri a Pompei. 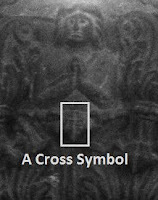 Pay attention to the sun-symbols. 1] The Early Indo-Hellenistic people i.e. early Indo-Greeks & Archaic Roman Empire were people who early came to Europe via various routes such as via seafaring trade routes during the Bronze Age. 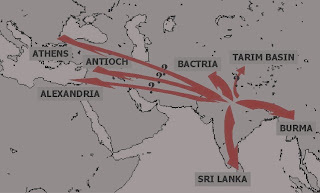 Indo-Greeks likely were the first major migrations from the East to North Africa, Africa, Middle East and southern Europe (Greece and Rome). Some of these ancient people and cultures later spread to the rest of Europe. 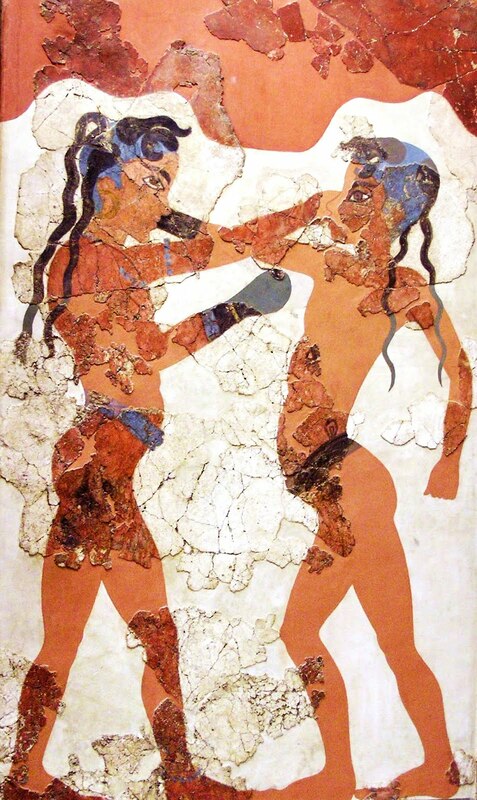 The Greek Minoan is a good example of Asian - European cultures of the archaic era. 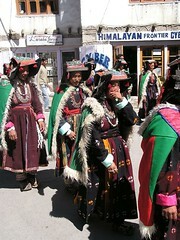 The new people mixed in part with the original populations and the exchanges of culture must have been mutual. The first Indo-European peoples settled in the vast areas which belonged to the archaic Roman Empire (i.e. pre-Christian and governed from Rome). 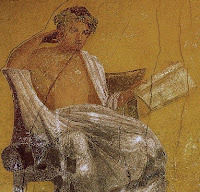 Possibly the archaic Greek & Roman cultures are associated with the spread of cultures since the era of Alexander the Great and before that the early Persian Achaemenid Empire (c. 550–330 BCE). 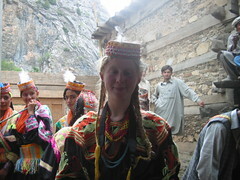 There were many different people involved in these cultural exchanges. 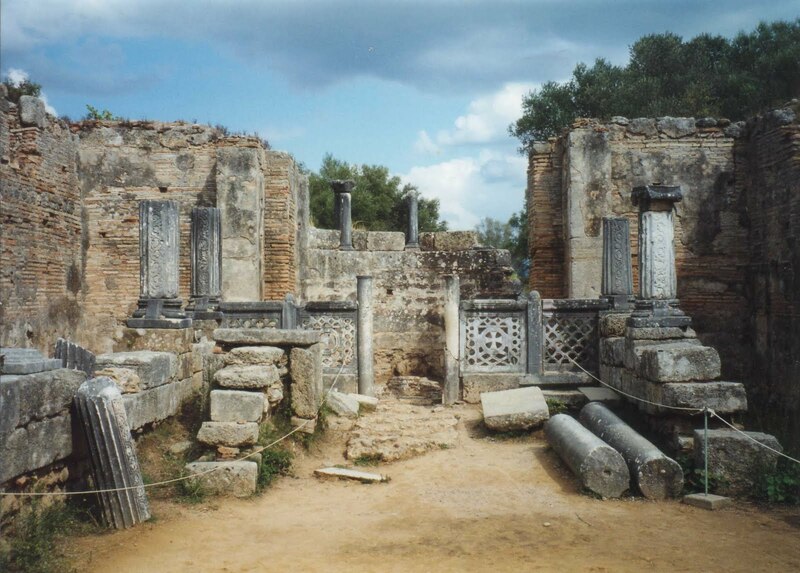 Many people with oriental origin came to Europe during the period of the great ancient empires. 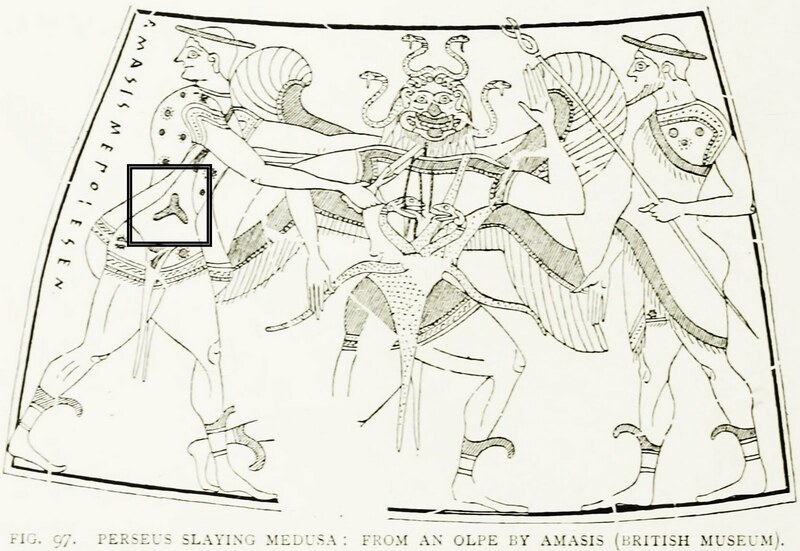 1) Minoan double Ax. Photo by Andree Stephan, 2001. 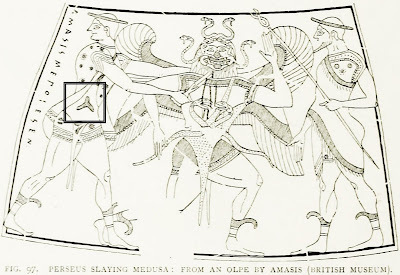 2) Knossos frise Minoan, the Prince of the Lilies. Photo by Harrieta171, 2006. 3) Saffron gatherers. 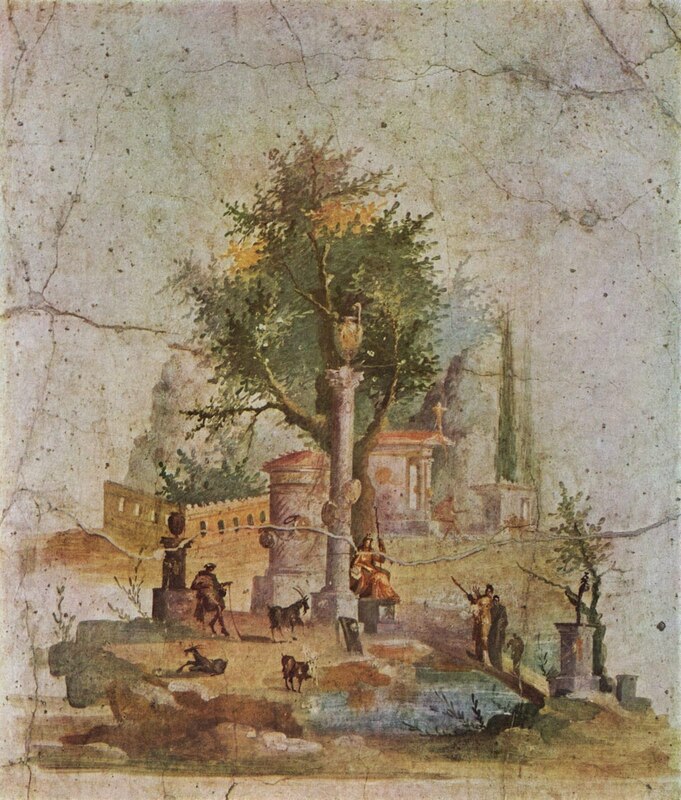 Archaic Greek Thera Santorini Minoan Fresco. 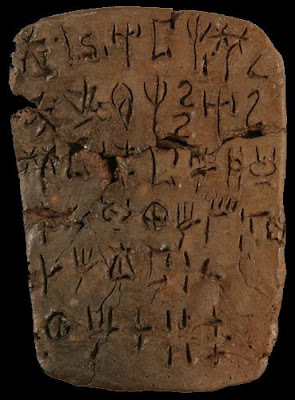 4/5) NAMA Minoan Akrotiri, Greece. Two boys are boxing. 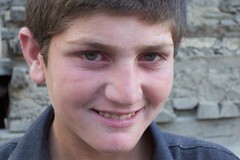 Photo by Marsyas, 2007. 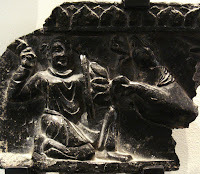 Some pictures of the archaic art are shown in this blog. The art of the archaic peoples were generally different from the art of the later Indo-Scythians, and the subsequent era of the Byzantine Empire. Archaic roman with text CONCOR. Mosaics exhibitied Arch museum Catalonia, Spain. 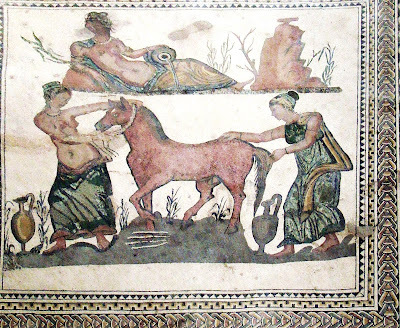 Detail of the same archaic Roman mosaics as over. Mosaics exhibitied Arch museum Catalonia, Spain. While the Indo-Greek cultures date back to the Bronze Age, the Indo-Scythian (see the previous blog) is much younger and to Western Europe they mass invaded during the medieval period. 2] Much later during the early Medieval Age: The Indo-Scythians (e.g. Huns and Turks) & Eastern Christian Roman Empire, i.e governed from Byzantine. 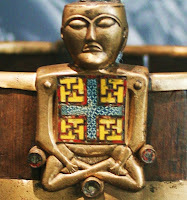 See previous blog post about the Scythian people. The Scythian people arrived via migration paths of the grassland steppes of Central Asia and later merged with the old people (i.e. indigenous people and the early settled archaic Romans) around the Black Sea, Eastern Europe and Caucasus. Some of the Scythians became part the cultural areas where Christianity later developed. 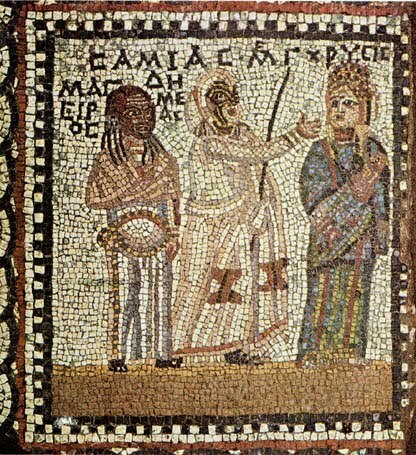 They were part of the peoples of the Christianized Roman Empire that was governed from Byzantium (it is a different and later Roman Empire compared to the early Western European archaic Roman Empire governed from Rome). The Indo-Scythians were probably very good soldiers and the Eastern Romans of Byzantium attacked, robbed and took charge over the older Western European Roman Empire. The people of Western Europe were forced to adopt an early form of Christianity or they were killed. 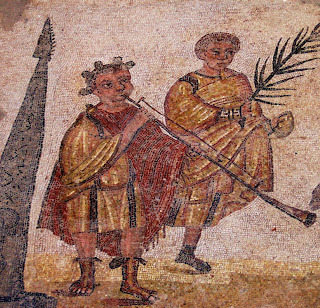 However, the earlier archaic pagan Roman Empire had also been established in the areas of the later Christian Eastern Romans including in the areas around the Black Sea, therefore some cultural continuity likely had persisted there with pagan elements. The Scythian people arrived much later westwards in Europe than the Indo-Greeks. They mainly came to Western Europe when Islam established in the areas where they had settled around the Black Sea. 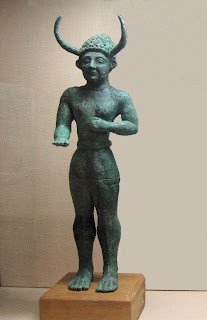 BODY IMAGES: I have already mentioned that the body images expressed in the art of the archaic Indo-Greeks and the people of the Archaic Roman Empire are noticeably different from the body images that are expressed in the art in the subsequent era of Indo-Scythian and Eastern Roman Empire influence. 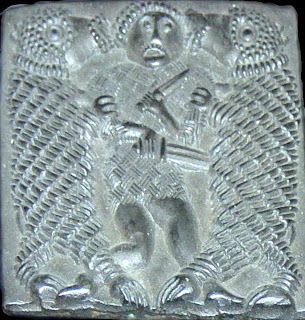 The Indo-Scythian body image have generally remained an ideal in European art, the people who came to Europe mainly since the Middle Ages still have strong definitional power in our culture. I have not added photos of this Scythian art: You can look at the photos of white marble statues of "ancient history" frequently used in Wikipedia. 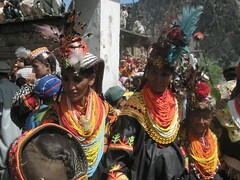 There were entire villages e.g. 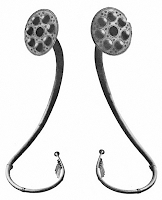 in Italy until the 19th century who reproduced old art, often with new ethnic expressions. 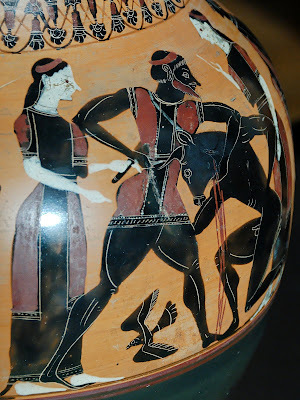 Archaic Greek art. Archaeological Museum Corfu. Photo by By Dave learns his Dig SLR, 2011. Archaic art: Scene from act, Samia or Samos. 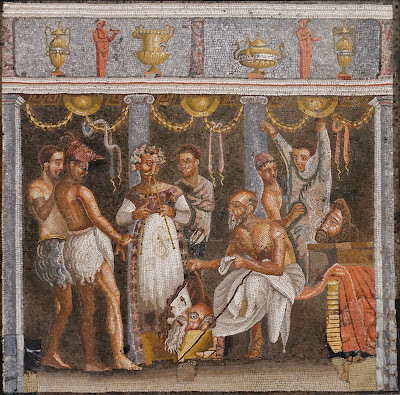 A mosaic panel from the dining room of the House of Menander in Mytilene, 3rd century AD (excavators) or later 4th century AD (S. Nervegna). 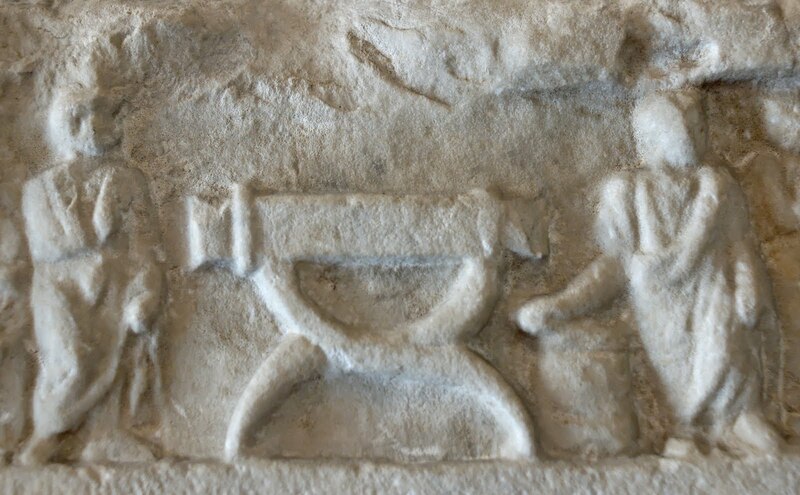 Archaic funerary relief representing a curule chair. 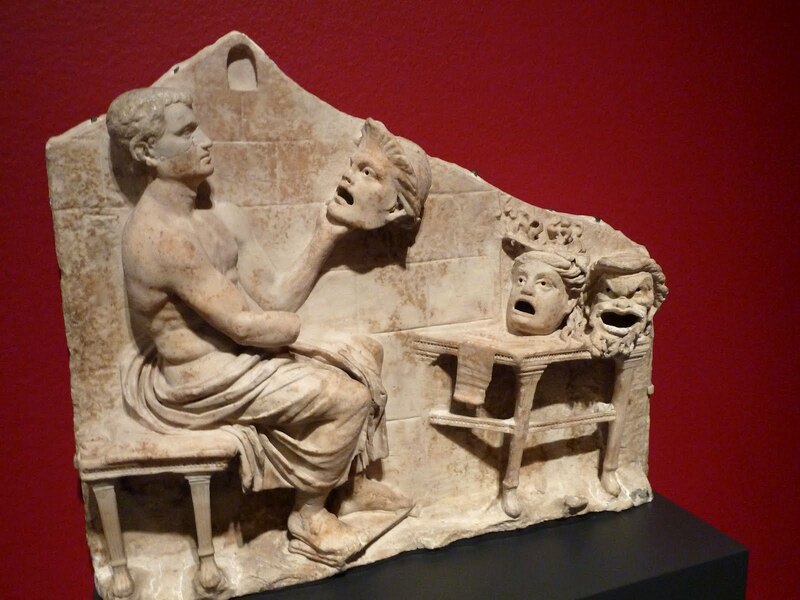 Marble, Roman artwork, 50 BC–50 CE. From the Torre Gaia at Via Casilina (Rome). Nationa Museum of Rome. 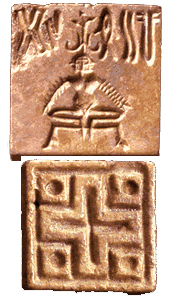 50 bce - 50 ce. Stele punica ex Museo nazionale del Bardo, Tunisi. Fenician i.e. Phoenician stele exhibited at the National Museum in Bardo, Tunisia. Photo by Giorces, 2007. 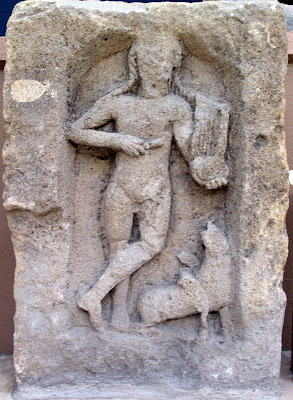 Archaic Apollon stele from Curtry, France. Musée lorrain, Nancy. Espérandieu 7612. 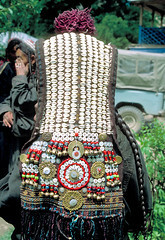 Photo by Marsyas, 2006. 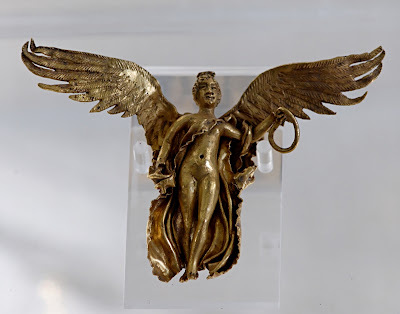 Archaic Greek winged Nike (victory), gold with a ring. Found in Athens. Valladolid villa Almenara mosaic. Villa romana de Almenara de Adaja, provincia de Valladolid (España). Spain. 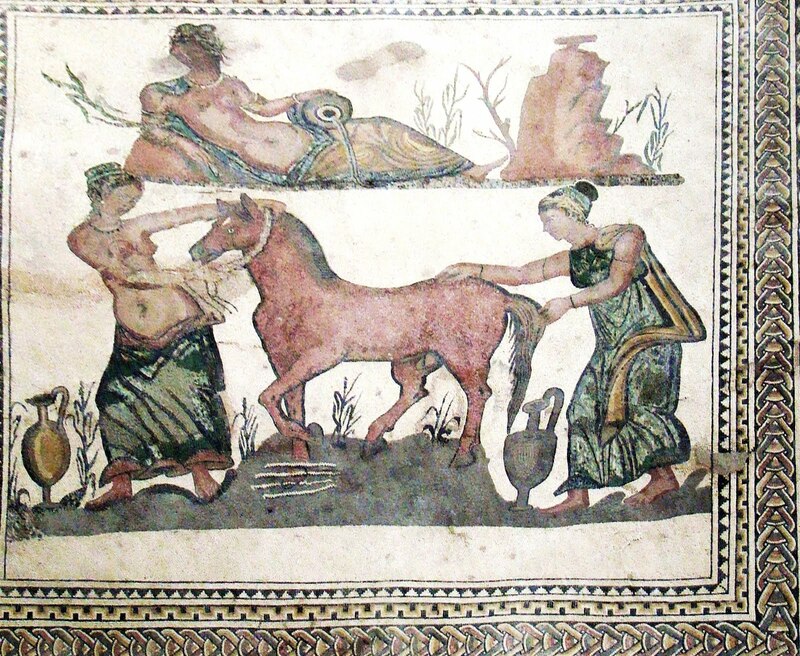 Mosaïque retrouvé à Utique représentant Diane chasseresse, 2ème moitié du IIème siècle. 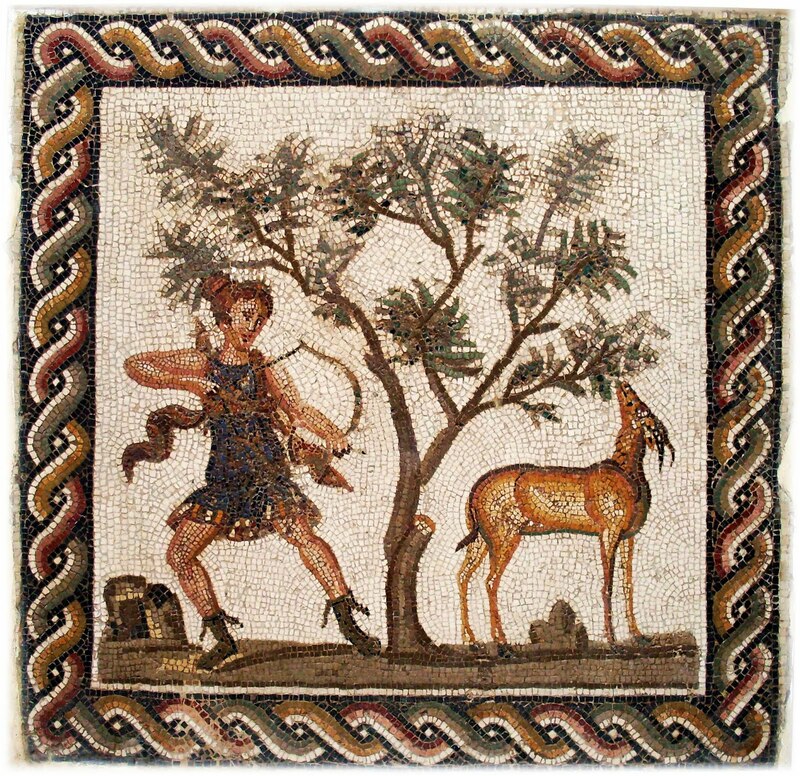 Archaic Roman Diane on a mosaic from the 2nd Century CE. Mosaic of Medusa (Detail, Perseus and Andromeda) 2-3 century CE. 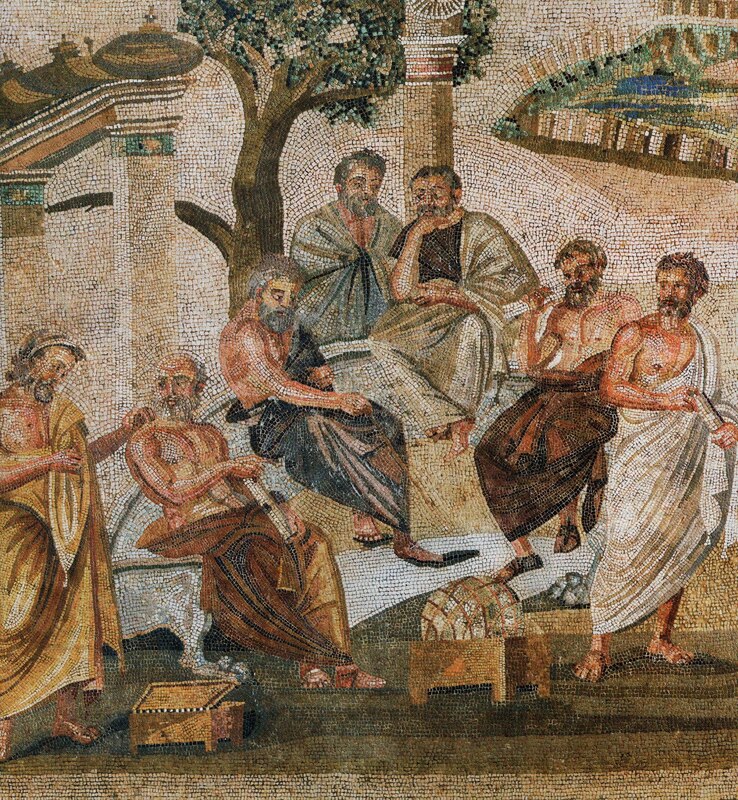 Kos, on the is left Hippocrates, then Asclepius, Asclepeion or Asklepios arrives to Kos. Photo by Dr. phil. 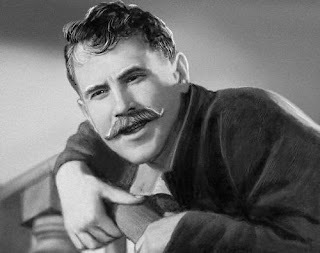 Heinz Schmitz. 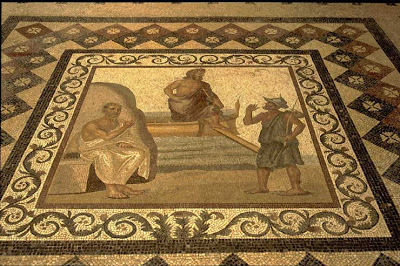 This man in this archaic mosaic (the travelling person carrying the bag on a stick) resembles Askeladden from a well-known Norwegian fairytale and the name of Asclepius or Asklepios is reminding me of this fairytale figure. 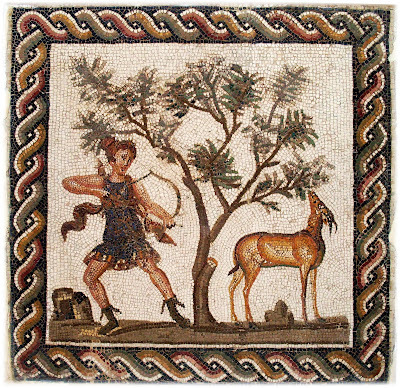 Roman mosaic of the 1st century BCE from Pompeii, now at the Museo Nazionale Archologico, Naples. 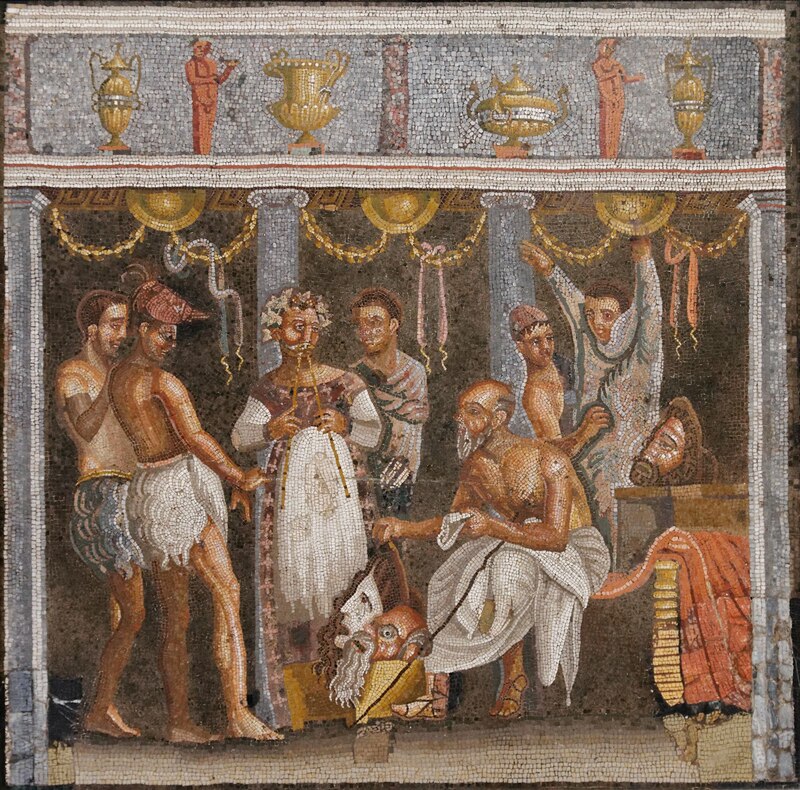 Choregos and actors, Roman mosaic. Naples National Arch. 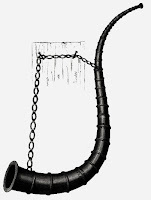 Museum, Inv. 9986. 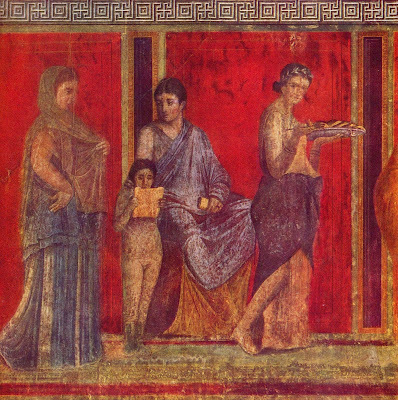 House of the Tragic Poet, Pompeii. Roman 3-4th Century CE Mosaic of Medusa at Arch Museum of Tarragona, Spain. Circassian man. Photo from 1898. 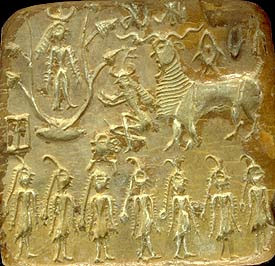 Two Khuvash men and ancient art of Scythians, 4th Century BCE. To Chuvash menn og eldgammel skytisk kunst fra det fjerde århundret før vanlig tidsregning. The Scythian Steppe people were often blonde people and in general they were tall people. Many ancient mummies of the historical Scythians are found from Mongolia and west-wards. 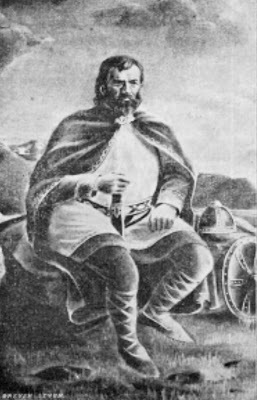 Ahmad Ibn Fadlan from Baghdad described the Scythians in the 10th century CE, when they were trading with the Volga Bolgars in the Russian areas. Fadlan described their stature as tall "as date palm trees", with beautiful bodies, with blonde hair and with tattoos. 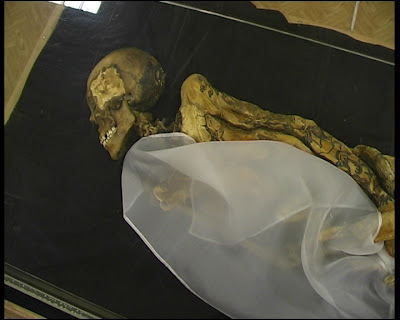 One of the mummies of a female - the ice maiden - had a body stature of 170 centimeters. Some warrior women of the ancient Scythians were called Amazons. The ancient Scythians were non-literate people according to archaeologist Natalia Victorovna Polosmak in the videos about the ice-maiden (scroll down for 5 videos), and it is told these ancient people used imagery e.g. 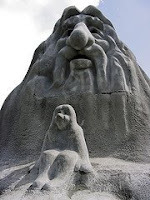 for storytelling which is indicated through their special type of rock art. However the just mentioned issue remains controversial. E.g. 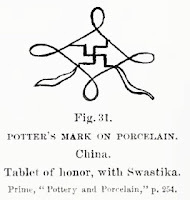 Aurel Stein (see reference in this blog) reported that the Scythian groups he studied were early Buddhists and used Kharosthi (alternatively Kharoṣṭhī) script. 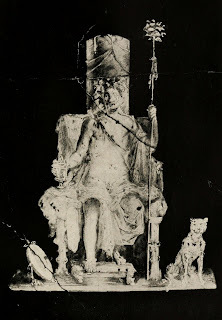 Princess Ukok (Altai) with tattoos: A mummy that was found in 1993 in a kurgan in the remote Ukok Plateau in the Altai Republic in Russia, which is now the subject of a fight about her future atatus between the republic Altai and its inhabitants on one side and the Novosibirsk Institute of Archeology and Ethnography (and the Russian Academy of Sciences in general) on the other side. De skytiske steppefolkene var ofte blonde folk, og generelt så var dette folket høye av vekst. Mange eldgamle mumier av de historiske skyterne er funnet fra Mongolia og vestover. Ahmad Ibn Fadlan fra Baghdad beskrev skyterne i det 10. århundret CE, mens de gjorde handel med Volga-bulgarske folk i Russiske områder. Fadlan beskrev dem som å være høye som daddelpalmer, med vakre kropper, blondt hår og tatoveringer. En av mumiene av en kvinne - is jomfruen - hadde en kroppshøyde på 170 cm. Noen krigerkvinner til de gamle skyterne ble kalt Amasoner. De gamle skyterne var ikke skrivekyndige i følge arkeologen Natalia Victorovna (se nedover i denne bloggen for å se 5 videoer av is-kvinnen fra Sibir), men deres spesielle type helleristninger indikerer at de brukte forestillingsevnen og fortellinger. 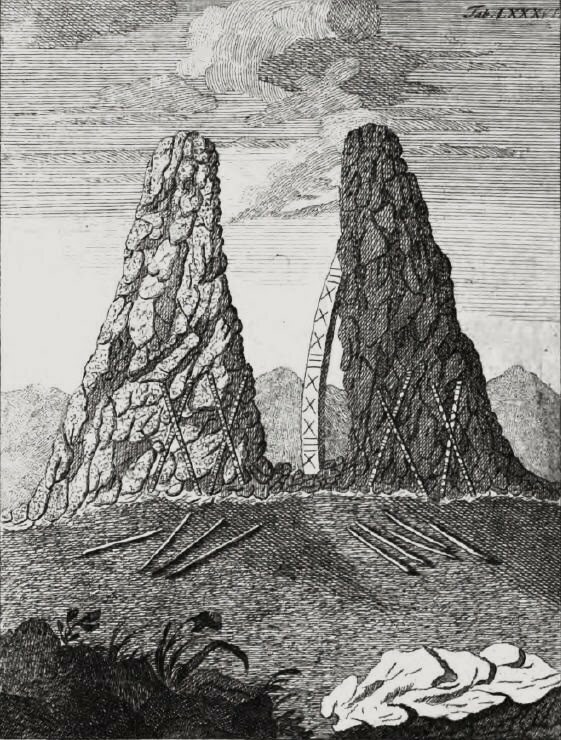 Det sist nevnte tema om skrivekyndighet er kontroversielt, for eksempel så fant Aurel Stein (se referanse i denne bloggen) at de Skytiske gruppene som han studerte var tidlige buddhister og bruke Kharosthi (alternativt Kharoṣṭhī skrift. 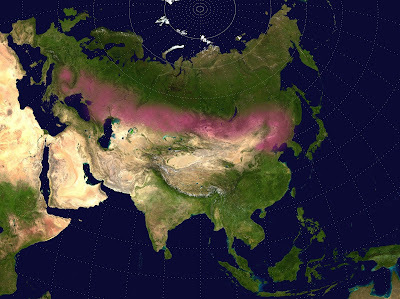 The Indo-Scythian migrations westwards was slower and much later along the Eurasian steppes (pink) than the southern Indo-European (Indo-Greek) migrations. 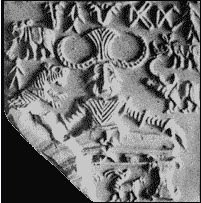 While the Indo-Greeks came in the Bronze Age, the Indo-Scythian people seems to have arrived to the Black Sea and Caucasus areas in the Iron-Age. Video: The Huns were Europeans called Scythians, English subtitles. Listen to what she has to say. She make a point that researchers have found that there was not really much difference between the Scythians and the Huns, and that Minayev (a Russian researcher) say that these historical people were the same. I am pointing to that these ancient steppe people were not Europeans (but indigenous Siberians merged with early Buddhists, but today they define who the Europeans are. Likely these Scythian men were the ones with mainly haplogroup R1a1. To realize this will make it possible to find back the oppressed archaic European history. The archaic Europeans were indigenous in the areas merged with earlier Indo-Greek migrations of Buddhists, they came mainly via seaway silk and trade routes. What happened in Europe, in particular in the medieval period? Hunerne var europeere som ble kalt Skytere (videoen har engelske tekster). Hør etter hva hun har å si. Blant annet så forteller hun at det ikke egentlig er så stor forskjell mellom skyterne og hunerne, og at en russisk forsker (Minayev) mener at dette er de samme gamle folkene. 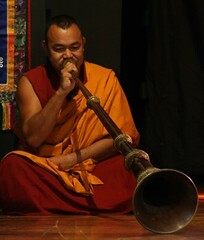 Jeg gjør et poeng av at disse gamle steppefolkene var ikke var Europeere (se video under, de hadde gener som tilhørte steppene og var sannsynligvis en blanding av urfolk i Sibir og tidlige buddhister), men at de i dag definerer hvem som er europeere. Dette var sannsynligvis menn som for det meste hadde haplogruppen R1a1. Å innse dette vil gjøre det mulig å forstå den arkaiske europeiske historien. Hva skjedde i Europa spesielt i middelalderen? 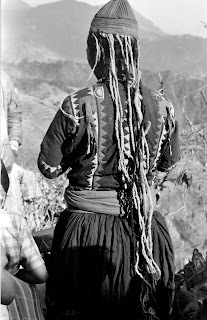 These ancient people of the Central Asian steppes have been there for a very long time. Blonde and tall mummies have been found in many places from Mongolia and the Tarim Basin areas and into Europe. 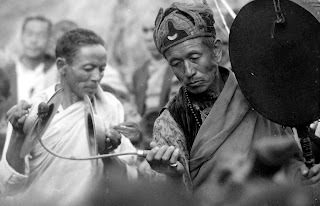 They have been described by and ancient Chinese Buddhist Monk who wrote that they had left the steppes before 400 CE (Read the books of Aurel Stein: The ancient Khotan. Can be found online for free). They had in general very different body ideals than the archaic Europeans (e.g. 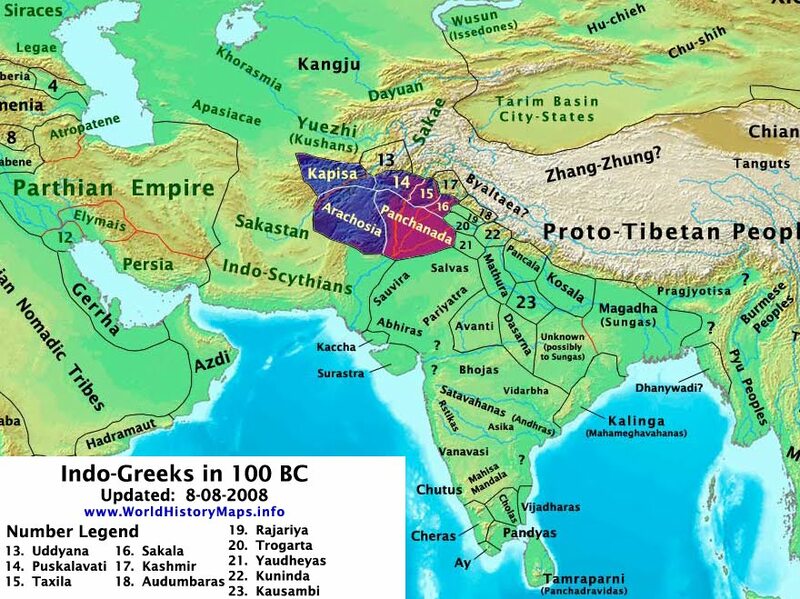 Indo-Greeks and Archaic Romans). Study all the illustrations in the referred books by Aurel Stein very carefully. 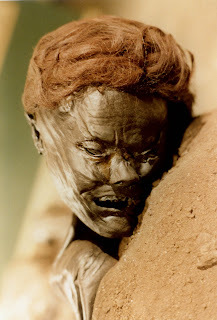 Two meters tall mummy found in the Tarim Basin. En to meter høy mumie funnet i Tarim (Takla Makan). Mummies from Central Asia includes the very tall Yingpan Mummy 6'6" tall. These mummies have genes from the Central Asian Steppes in particular many are found in the Ukok Plateau, a plateau between the borders of Kazakhstan, Russia, Mongolia and China. 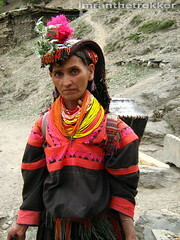 These people are very old in Central Asia, before any known silk-road routes in these areas. However these old Mummies look like present day Europeans, some mummies have yellow - blonde hair (as have a few of the Buddha figures found in archeological sites along the Central Asian Steppes). These old steppe people had different types of e.g. 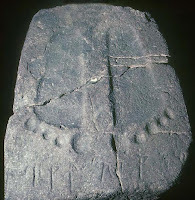 petro-glyphs than found elsewhere and their art are different from the ancient art of Europe. These ancient tall and often blonde people on the Central Asian Steppes were early Buddhists (referring to ancient texts and archeological findings reported in literature). As pointed previously there were other and much earlier migrations of early Buddhists westwards and into Europe. 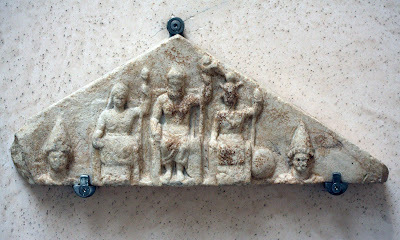 Early Buddhists came via southern paths to Hellenistic areas e.g. 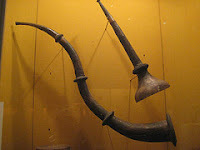 via sea routes in the Bronze age, a good example are Indo-Greek Minoans (see next blog). 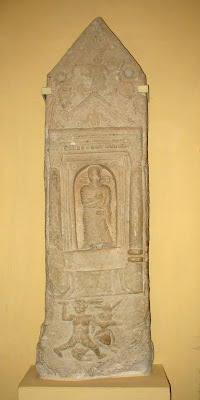 1) Buddhist Relief from a wall decoration. 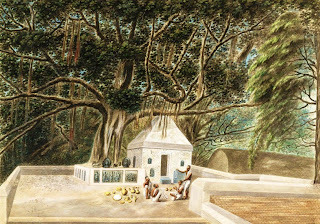 Shrine from Dandan-Uiloq. 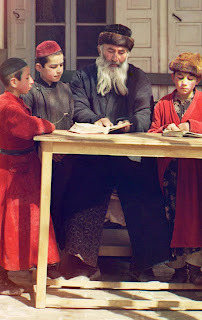 The ancient Khotan people (Turks & Scythians) seems to have been Buddhist, but must have converted to Judaism or Christianity when they came to the areas around the Black Sea. 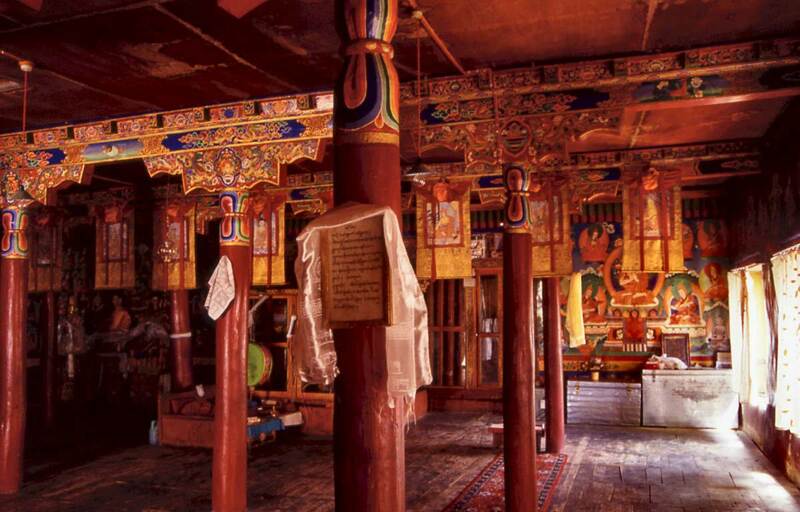 Disse eldgamle Khotan folkene (Tyrkere & Skytere) ser ut til å ha vært buddhister, men må ha konvertert til jødedom eller kristendom da de kom til områdene rundt Svartehavet. Scythian Pazyryk felt carpet. 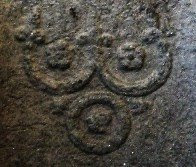 Fragment of felt carpet found in Pazyryk, Altay Mountains. 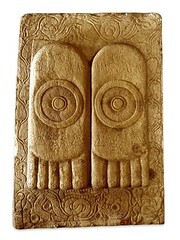 First millenium BCE. Skytisk Pazyryk filtteppe. Et fragment av teppet ble funnet i Pazyryk i Altai-fjellene i dagens Russland. Det er fra det første årtusen BCE. Pazyryk Carpet detail. 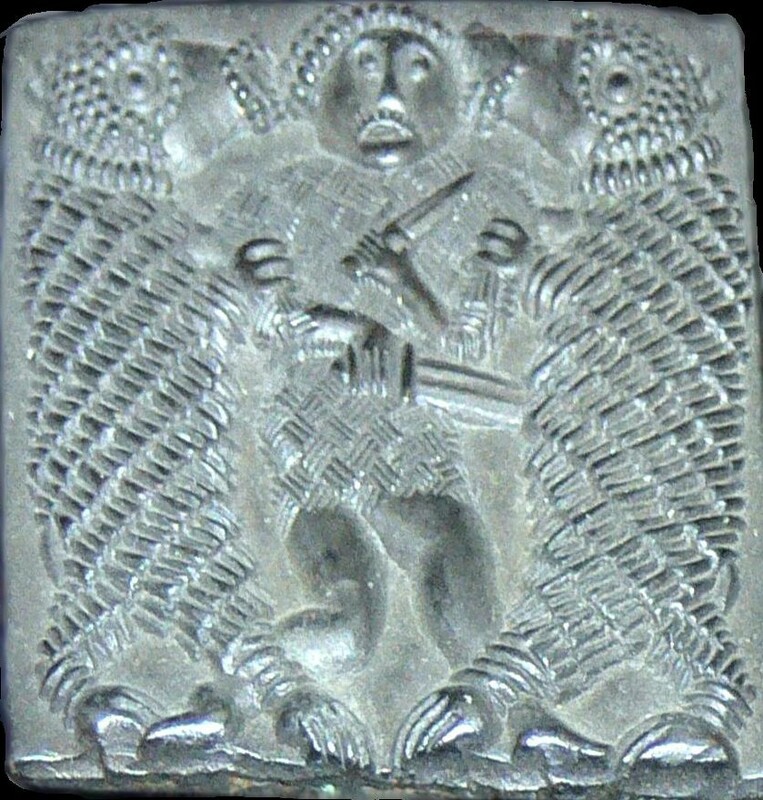 Indo-Scythian. Pazyryk carpet 4th Century BCE. Blonde men ridning horses. I doubt that these the Scythians mentioned by Fadlan i.e. 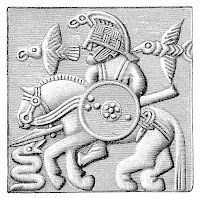 "Rus" people were related to the Nordic "Vikings", as some want to make us believe. 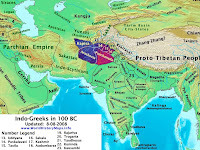 The cultural similarities are related to the early Buddhist (Saiva) influence of both the arachaic Indo-Greeks & The Western Roman Empire in Europe and the Indo-Scythian people of the Central Asian Steppes. Some of the differences are described in the sources of this blog, including the Videos. The description of them does not fit with ancient western European remains or descriptions e.g. 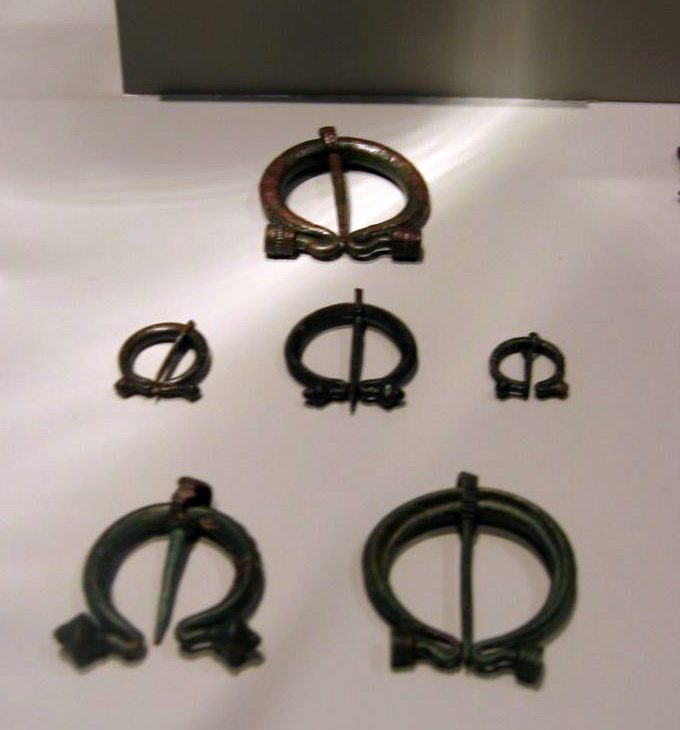 at Arran in Scotland or for instance in Iron Age Denmark (ref. Bog men). The ancient and pre-medieval people of Western Europe were most likely of Celtic and then people of early Indo-European origin from southern paths i.e. sea faring peoples via the Middle East, Turkey, Archaic Greek and Roman (Italy) areas. Chuvashia culture parade – Tsjuvasjia opptog, drillpiker, maistang, og korps. Folk song from Chuvashia. Folkesang: Han synger på Tsjuvansk. Jeg tviler på at disse som Fadlan beskrev dvs. de østlige Skyterne som ble kalt "Rus" har noe med de nordiske vikingene å gjøre, slik som noen prøver å få oss til å tro. 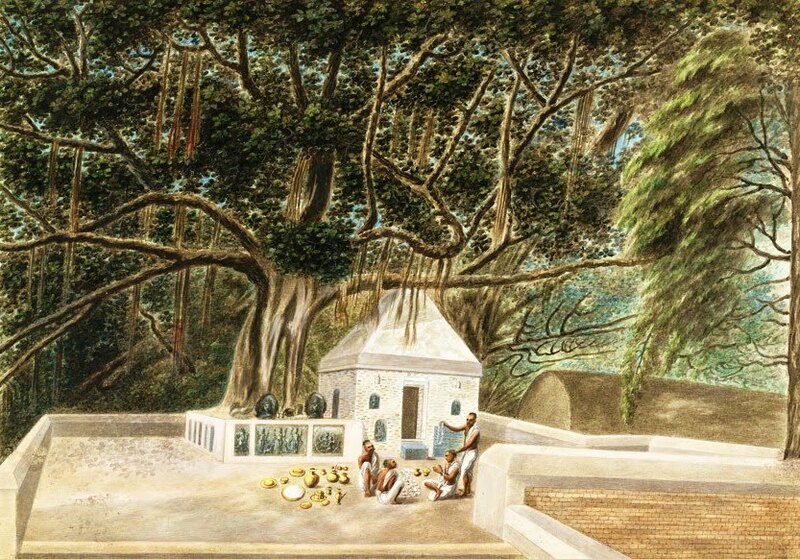 De kulturelle likhetene er relatert til den tidlig Buddhistiske (Saiva) innflytelsen hos både de arkaiske Indo-Grekere & Det Vestlige Rommeriket og blant de Indo-Skytiske folkene på de Sentral Asiatiske steppene. Noen av forskjellene kan man finne beskrevet i de oppgitte kildene og videoene. Beskrivelsen av dem passer ikke inn med gjenlevninger av det eldgamle dvs. arkaiske vest europeiske folkene for eksempel fra Arran i Skottland eller fra jernalderens Danmark (e.g. myr mumiene). De eldste og før-middelalderske folk i Vest-Europa var mest sannsynlig forbundet med Kelterne og med tidlige Indoeuropeiske folk som hadde kommet vestover via sørlige veier, for eksempel sjøfarende folk som kom via Midtøsten, Tyrkia, og de arkaisk Greske og Italienske områdene. Chinese (Kineser), Laplander (Samisk), Hottentot, Neger & American (Amerikaner). 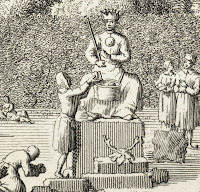 Print from 1700- 1800's. A tall Chinese man. En høyvokst kineser. 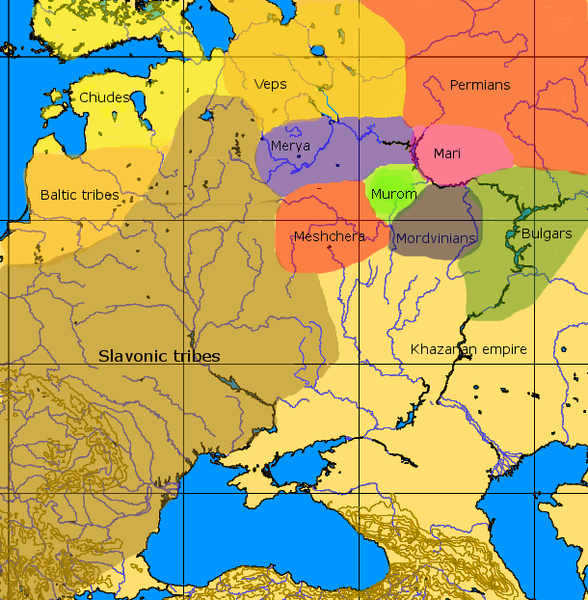 The Scythian people migrated westwards over the grass steppes to Eastern Europe and they merged with the Eastern Christian cultures that developed. Later several groups of people from Eastern Europe (e.g. 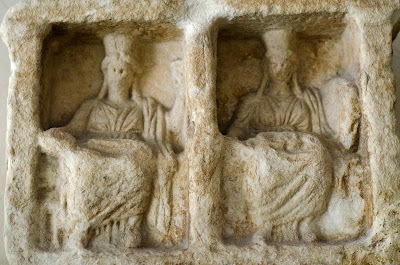 Darian’s, Jews, Vandals, Sarmatia’s and others) were pressured towards Western Europe during the medieval period. The Scythians had been christianized and became a violent wave of christian crusaders as Islam established in eastern Europe and pressured them further west into Europe. 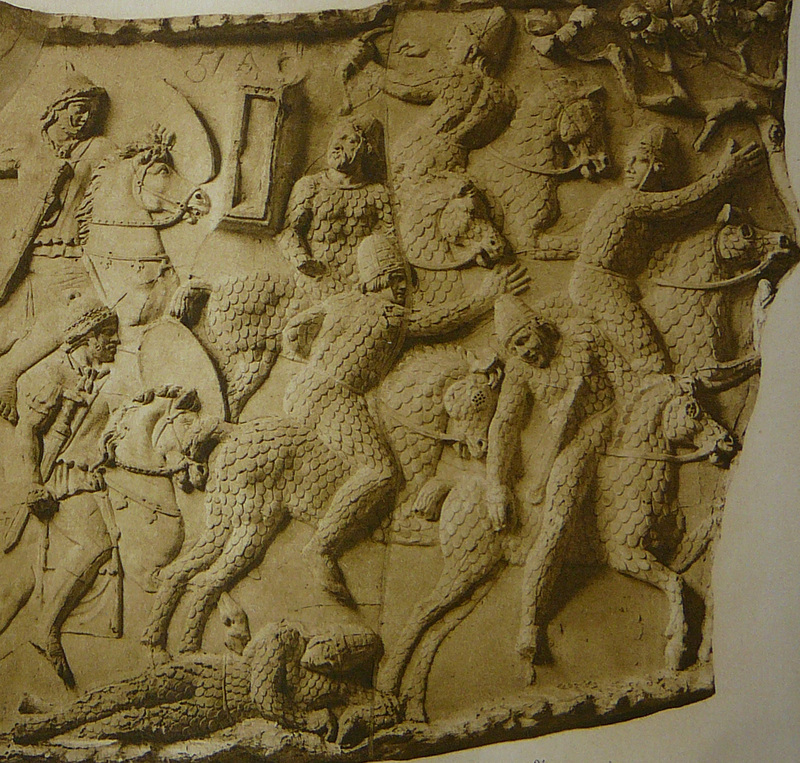 The ancient Scythians are later known as Kurgans and Sarmatia’s. They did without doubt migrate further westwards than for instance modern Ukraine. De skytiske folkene migrerte vestover over gresslandet på steppene til Øst-Europa og der blandet de seg etterhvert med disse østlige kristne kulturene som hadde utviklet seg. Senere ble flere grupper av folk fra Øst-Europa(for eksempel Dacias, Jøder, Vandaler, Sarmatia og andre) presset mot Vest-Europa i middelalderen. Skyterne var blitt kristnet og ble en voldelig bølge av korsfarere ettersom Islam etablerte seg i øst og presset dem videre vestover i Europa. 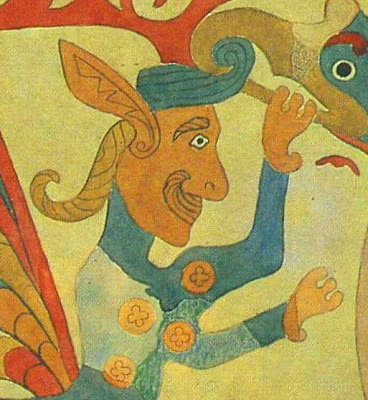 De gamle skyterne er senere benevnt som Kurgan og Sarmatian. De migrerte uten tvil lengre vest enn til dagens Ukraina. 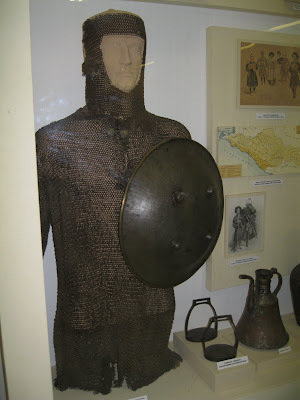 Medieval military outfit Sochi. 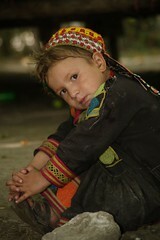 Photo by Alexander V. Solomin, 2012. In medieval time Denmark was named after several of these arriving crusaders from Eastern Europe: The name of present Denmark and parts of Swedish Scandia became “Dacia” (Nicolai Doni, 1482 Map). The Dacians were ancient people of Romania that had been pressured westwards with other groups of Eastern Europeans. 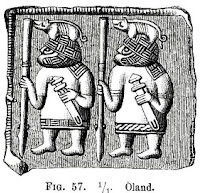 Another part of Denmark was called “Judland” (P. Claussøn Friis, 1632, page 9. in "Norriges oc omliggende Øers sandfærdige Bescriffuelse") after the arriving Jewish populations from the same areas; this area of Denmark is today called “Jylland”. 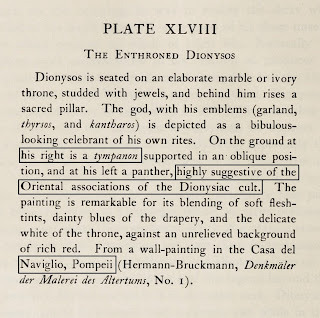 Still today there are clear folkloristic parallels of medieval origin(e.g. 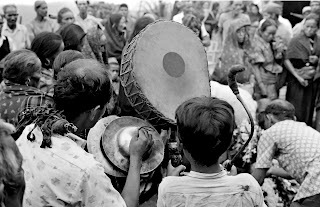 dance, folk songs, traditional garments, musical instruments, art) between people in parts of Southern Scandinavia and these Eastern European groups of people, e.g. Carpathian Romania. I middelalderen fikk Danmark navn etter flere av disse korsfarere folkene fra Øst-Europa: Navnet til dagens Danmark og deler av Skåne i Sverige ble kalt “Dacia” (ref. 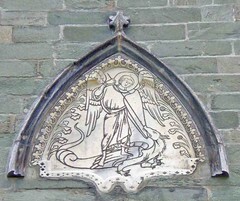 kartet til Nicolai Doni, 1482). Dacian folket er et gammelt folk fra Romania som også delvis var blitt presset vestover med andre grupper av øst-europeere. En annen del av Danmark ble kalt “Judland” (ref. P. Claussøn Friis, 1632, side 9, i "Norriges oc omliggende Øers sandfærdige Bescriffuelse"), navnet fikk de etter Jødiske befolkninger som kom i samme bølge; i dag kalles dette området for “Jylland”. 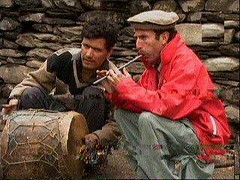 Fremdeles kan man se klare folkloristiske paralleller fra middelalderen mellom det sørlige Skandinavia og disse Øst-Europeiske gruppene av folk, for eksempel med folk i Karpathian Romania. 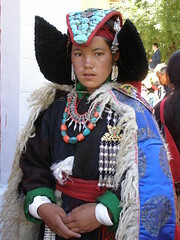 People of Scythian descent were a later arriving group of Indo-Europeans or Euroasians. The earliest Indo-Europeans had come via southern paths e.g Middle East, Archaic Greek and Italy (Rome). 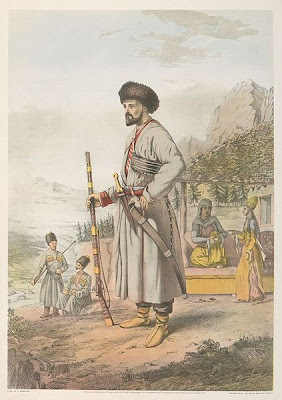 Illustration of Circassian, 1862. The Indo-Scythian people is also called Caucasian people, they early spread to North-Africa, Greece, Spain and destroyed the archaic pagan Roman Empire. Later during the medieval period they came to Western Europe because of the expansion of Islam in the areas of Constantinople. De Indo-Skytiske folkene er også kalt Kaukasiske folk, og de spredte seg tidlig til Nord-Afrika, Hellas, Spania og det var de som ødela det første før-kristne Romerriket. I løpet av middelalderen kom flere av disse folkegruppene til Vest-Europa da Islam spredte seg i områdene rundt Konstantinopel. Thor Heyerdahl har jo også påpekt at hans folk kom fra de områdene, selv om han nok kan ha tatt feil mht. Odins opprinnelse der. Det er jeg usikker på, fordi stedsnavn Udin, Udine navnet kan følges over de sentralasiatiske sletter og inn i Norden, de Baltiske stater og vestlige Russland. De samme kan plassnavn som helt klart kan assosieres med "det jødiske". Descendants of the ancient Scythians were not Vikings, the Scythians were Christian crusaders of the Medieval. They had been christianized by the Jews. 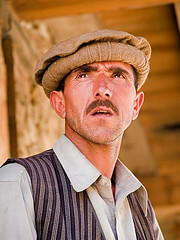 Khan is a Jewish name, is it possible that the Jews have several different origins. Etterkommerne av de gamle skyterne var ikke vikinger, skyterne var korsfarere som kom vestover i middelalderen. De hadde tidlig blitt kristnet av jødene. Khan er et jødisk navn, kan det være slik at Jødene har ulik opprinnelse? 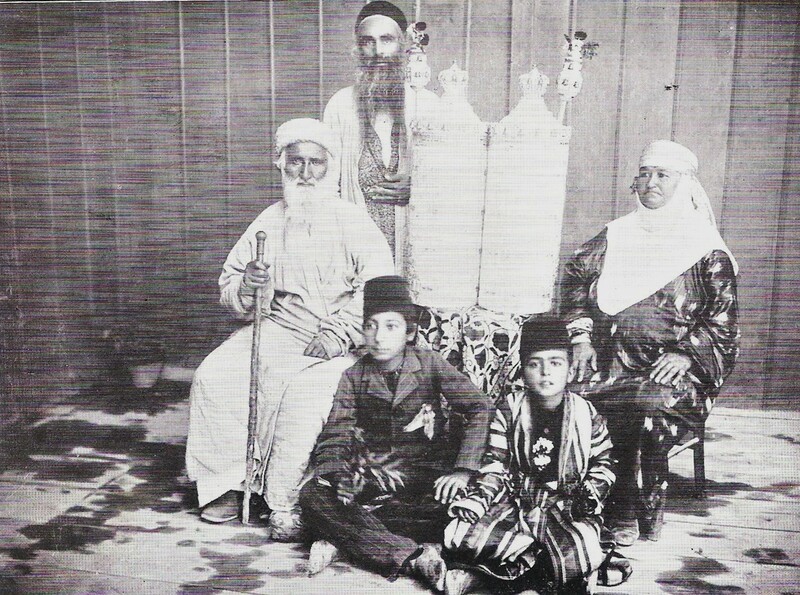 Photos: Jewish Children with their Teacher in Samarkand. Russian Empire from 1909 to 1915. Jødiske barn og deres lærer i Samarkand, Russiske Riket mellom 1909 og 1915. The next photo is of a painting of a Jewish man. Grandfather Vlas by Rafail Sergeevich Levitsky (1895). Chuvashia Republic. 1895. Det neste bilde er av et maleri av en jødisk mann. The Black white photo is of Bukharan Jews before 1890. 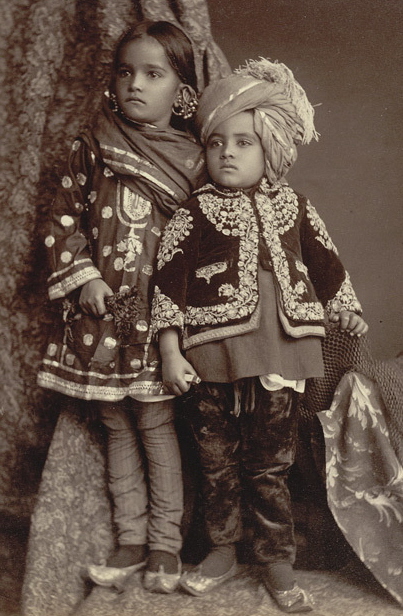 Svart hvitt fotografiet er av jøder fra Bukhara før 1890. "Jute" is found in a book by Samuel Kliger (1952): “The Goths in England: A Study in Seventeenth and Eighteenth Century Thought”. In this book by Kliger he makes word connections between “Jute” and “Gothic” and he mentions old English names that might be identical with a Geat-form: Northumbriam [Iote, Iotan], Mercian [Eote, Eota], Early West Saxon [Yete, Ietan], Late West Saxon [Yte, Ytan]. The connection made here between “Goth” and “Jute” is likely an intended confusion. 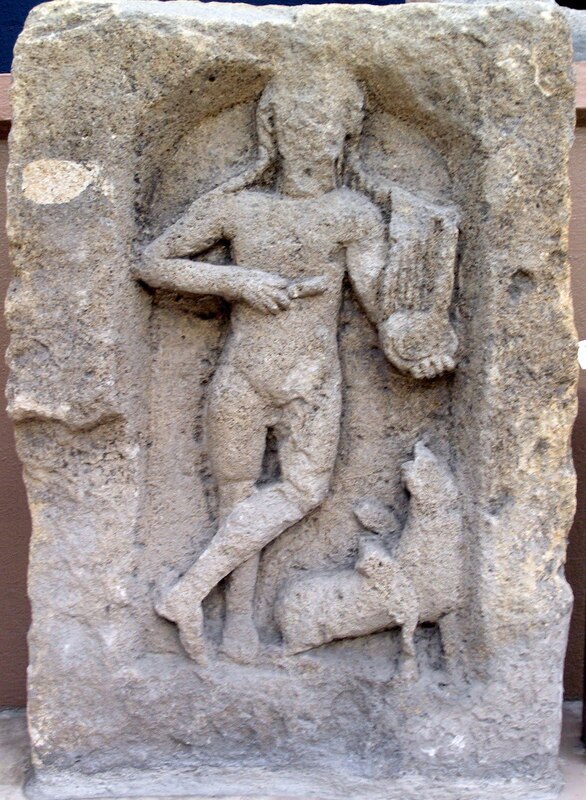 The Goths was first of all related to the archaic pagan Roman Empire governed from Rome. 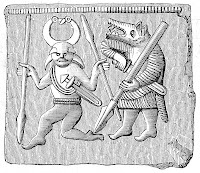 The ancient Nordic Goths in the Nordic was related to an Iron Age culture, while the Jute is related to Medieval Christian migrations from the Eastern Christian Roman Empire governed from Constantinople. 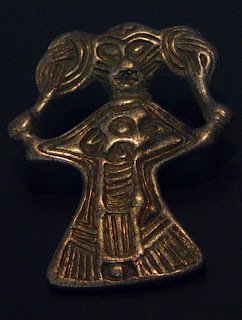 Research has shown that the Nordic Saga literature which includes the Edda books has been changed until recent history by the Christians, so it is not a good source. If you see this history in a medieval perspective it becomes interesting. 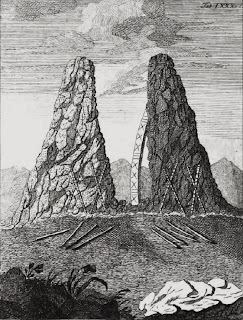 I have previously in this blog mentioned a book “Eddalæren og dens oprindelse” by Finn Magnusen (1824): It is told about mythological "Giants" i.e. "Jætter" (danish language). 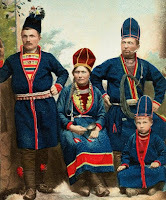 The Swedish Sami Laplanders called the Giants for ”Jatton” and the Finlanders used several names to describe them such as “Jätit”, “Jutut”, “Jutas” or “Jattolaisit”. The younger Norwegians call them “Jutul” or “Risar”. 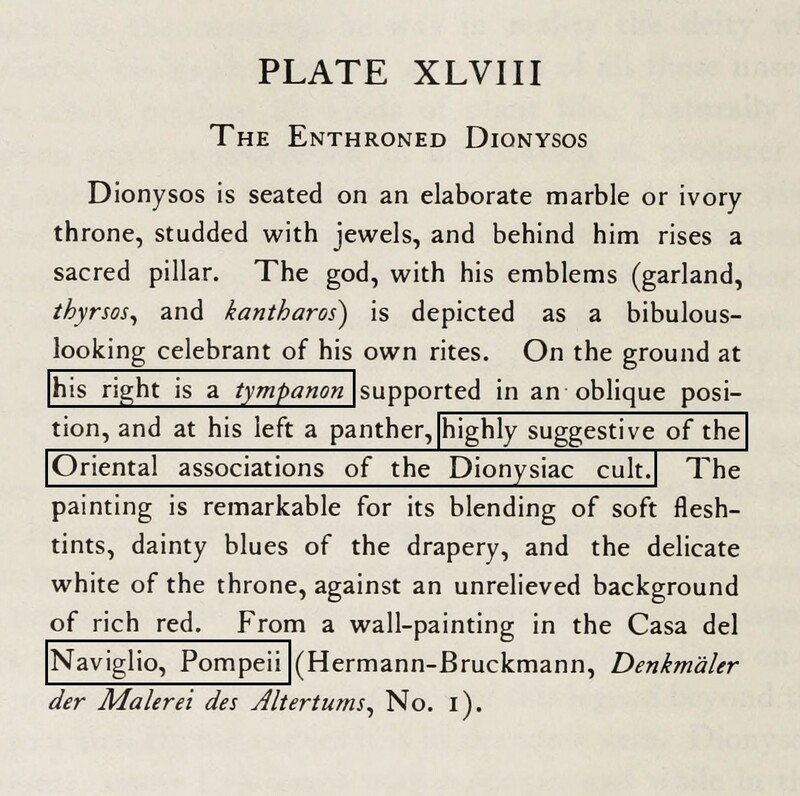 I am ignoring the mythological semantics regarding these names mentioned by Magnusen, the syntax resemblance of these names are interesting in relation to "Khotan" and “Hotan” and for the ones mentioned by Kliger to e.g. Jute and Iotan. 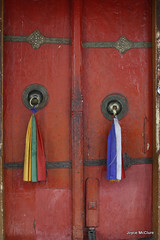 Khotan and Hotan were ancient Buddhist cultures of the Central Asian steppes. See previous blog. 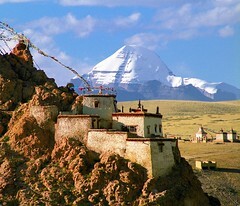 The cultures of the Central Asian Steppes such as Hotan were also inspired by the first Buddhist (Saiva) cultures of southwestern Asia such as the Khotan. In these links you can see photos of a mummy of an ancient Scythian Male with blonde hair and tattoos. They were still present on the grass-steppe-lands of Central Asia between 8th to 3rd Century BCE or even older: This mummy has been exhibited in Germany in a show called “Under the sign of the Golden Griffin”. In one of the videos posted it is told that they had no written language. 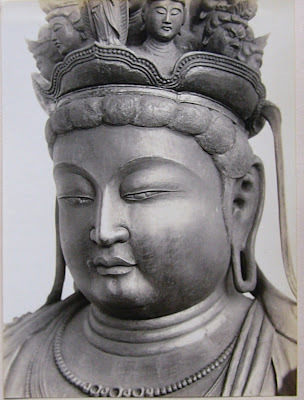 As shown by the excavations by Stein Aurel the Scythian people had early adopted an early form of Buddhism as is reflected in their ancient culture . One of the Scythian cultures is called Pazyryk, several mummies are found from these ancient people, similar traditions as the later Ukrainian Scythians or Kurgans and the Caucasian people such as the Sarmatians. 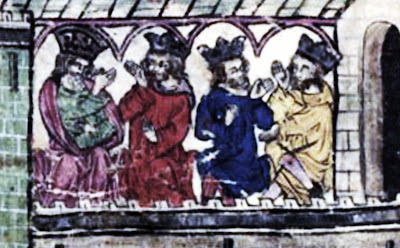 Khans of the four uluses Temür (Yuan), Chapar (Ulus of Ögedei), Toqta (Golden Horde), Öljaitü (Ilkhanate).Hayton of Corycus, Fleur des histoires d'orient. 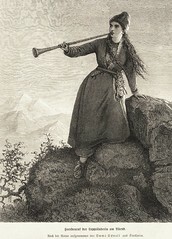 The Circassians are related to Chods or Chods or Khodz are related to more northern people like those of Chuvash. These are likely old names related to Jewish people. Origin seems to be the Central Asian steppes and large groups migrated to and settled in the areas around the Black Sea and Caucasus. 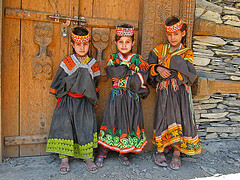 However the people of Circassia and related people expanded fast with the Khanates in the Medieval Period. From depictions of the Western Hordes, these must have been of other ethnic origin than the eastern Khans. As can be seen from place names along their migration paths they were Jewish people. Several of the ancient places had or have Jewish related names such as Yotkan and Khodz. Photos: 1) Circassian in present day Israel. 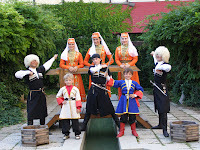 2) Cherkess or Circassians. Jewish related names which came westwards with medieval migrations and settlements: Chuvash is a republic of Russia south east of Kazan. Their language is in Norwegian called “Tsjuvasjisk” or “tsjuvask”, in Polish language “czuwaski” in Ukraine it is named “чуваська / tsjuvas'ka”. Chudovo (Tsjudovo) is a town in Novgorod Oblast in Russia. “Chud” is also related to Estonia and in western Russia the Veps which according to Ronald Wixman (The Peoples of the USSR: An Ethnographic Handbook) had names like “Chud” and “Chudin”. Even in the Sami areas of Murmansk Oblast there is a place name “Chudz'yavr”. “Chudin” in Belarus, “Chuden” in Germany, “Chudec” and “Chudir” in the Czech Republic, “Chudek” and “Chudow” in Poland. “Chud” are place names in Vladimirskaya Oblast and Ivanovskaya Oblast Russia. Then there are “Chudel, Chudey, Chudin and Chudla” in Ukraine and there is Khodz in Georgia (Ossetia) and “Khodz” is a river and a town in the Russian republic of Adygeya. These are a few of the names which indicate the migration and settlement of the Jews in medieval Europe and Caucasus. Muromian-map. Map by Wiglaf 2007. See place names "Chudes" in present day Estonia. Spain Avila iglesia San Vicente cenotafio martires. Photo by Lourdes Cardenal, 2009. Pay attention to the snake around his neck. Spain Avila iglesia San Vicente cenotafio martires. Photo by Lourdes Cardenal, 2009. Spain Basílica de los Santos Hermanos Mártires, photo by Outisnn, 2009.